A hot topic at ICANN 58 was the question of what must still happen before the next round of new TLD applications can be launched and whether or not the process can be accelerated. It turns out a number of obstacles are making a firm date for the release of new domain extensions difficult to pin down. In 2008, ICANN (the Internet Corporation for Assigned Names and Numbers) officially began accepting applications for new extensions, having made the decision to stagger all applications in limited rounds. In October 2013, delegation of these extensions began. As of today, 1,216 domain extensions have been delegated with 86 more to be delegated in the near future. ICANN’s goal is to launch subsequent gTLD application rounds as quickly as possible. The exact timing will be based on experiences gained and changes required after [the first round] is completed. The goal is for the next application round to begin within one year of the close of the application submission period for the initial round. Clearly, the timeline presented here was overly optimistic, not taking into account the amount of time that would be needed to review the programme, a review that is, indeed, still underway. 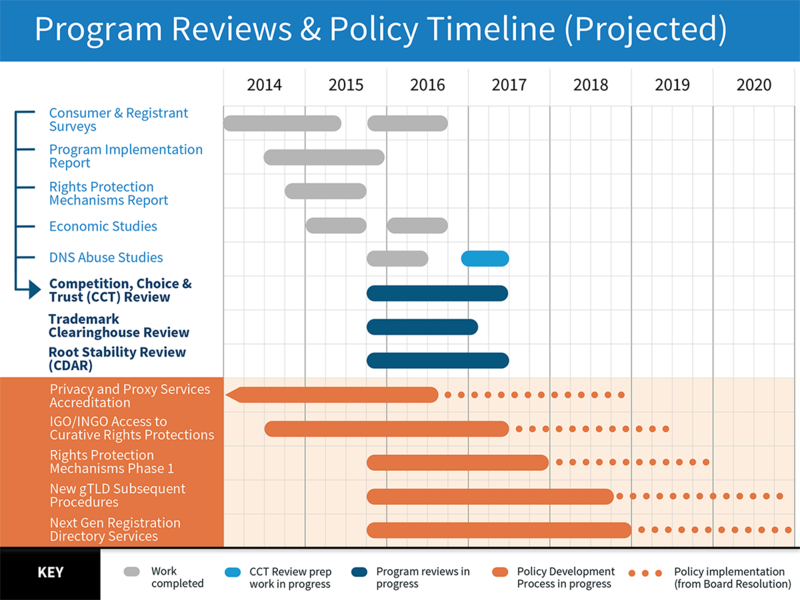 As discussed at ICANN 58 this past March, there are currently three review processes happening, all of which are running in tandem, and all of which will need to be finalised before a second round can be opened. 1. What subsequent procedures must be in place for new gTLDs? The Subsequent Procedures working group is looking at various aspects of the procedures that were in place for the first round, revising and amending these procedures where necessary. And although some procedures have already been addressed, others – which are more complicated – still require work. The Subsequent Procedures group has said that it hopes by the end of this year to have both finalised work on these procedures and issued an initial report on its findings. Likewise, the Cross Community working group, whose focus is on Country and Territory names, is still trying to reach a consensus on whether or not the next round of applications should allow for 2-letter extensions. Although the group had originally concluded that 2-letter extensions shouldn’t be allowed in the second round as 2-letters are specifically reserved for ccTLDs, some dissension has left this issue unresolved. 2. How effective are the All Rights Protection Mechanisms currently in place? A different working group, tasked with reviewing All Rights Protection Mechanisms, are actively reviewing the use and effectiveness of the TMCH, the UDRP, the URS, and the lesser used Post Delegation Policy. This group hopes to publish a partial report of its findings sometime later this year with a second report ready by early 2018. 3. What improvements must be made to Registration Directory Services? A fourth working group is developing policy for the new WHOIS system, an enormous undertaking with no clear end date. Expediting the next round of new domain extensions: you can help! ICANN is currently eyeing a 2020 date for the second round of new TLD applications. However, to make 2020 a realistic date, leadership form each of the above working groups has called on members of the industry to get involved. There is still much work to do. If you are able, please consider joining one of the above working groups to expedite the process or, at the very least, provide ICANN with comments on reports submitted by these groups. Emails can be sent to GlobalSupport@icann.org with “New gTLD Program Reviews” in the subject line.